Some years before the takeover in December 1925 by the American automotive giant General Motors, Vauxhall considered building a motorcycle. 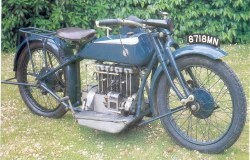 The project was rather more ambitious than the usual immediate post-WWI singles and V-twins. 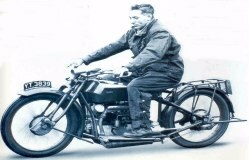 The model was penned by consultant engineering designer Major Frank Halford ( a friend of Harry Ricardo whose four-valve Triumphs Halford racer with success at Brooklands) and comprised an inline ohv four-cylinder engine driving through a car type three speed gearbox with shaft final drive to the rear wheel. Vauxhall tooled up for a pilot batch of six 944cc (originally claimed 930cc) machines but as few as two were built - probably having costed the exercise, Vauxhall deemed it a non-starter.